I think this is something that would do well during the Thanksgiving and Christmas seasons. This Thanksgiving I just don’t feel thankful at all. I have been through multiple tough things in 2012 and this Thanksgiving just feels like a bummer to me. By the way; Geek Alabama will be transformed into Christmas 2012 over the weekend! No doubt; 2012 has been a very tough year for me. I have been unemployed for 16 months! And I am still on that quest for my 14th job in seven years. I have tried everything to find work. I applied to many jobs online. I went to 14 job fairs so far in Anniston, Gadsden, Birmingham, Boaz, and Roanoke. I have tried every temp agency in the area with no success. I have gone to several job events for openings like Publix and several factories. The only problem is hundreds of people turn out along with me. I have also chased down any job leads in the newspapers like the Anniston Star. But nothing has happened there as well. During the presidential election between Obama and Romney. I Tweeted out something that got picked up by Headline News and CNN! I was so happy seeing my Tweet re-sent by many people! Then I got this reply from this person which hurt me big time! Yes; there are people out there who believe I am lazy and not looking at all. I did reply to Douglas Cole and I have not heard from him again. I also believe the reason I am not working is because of my disability which is Asperger’s Syndrome. In some of the last 13 jobs I did; I was put in some tough situations where I would screw things up. Some of the crazy things I did on the job include dropping multiple gas caps in the water, breaking the soda machine, dropping food, breaking plates, causing an accident with the bosses car, etc. You name it; if it’s a fast-paced job I have a good chance of breaking something. Over the last year I have had great success with Geek Alabama. I have been involved with multiple great events in NE Alabama/NW Georgia. I have volunteered with several events and with TV 24 Pigskin Roundup. 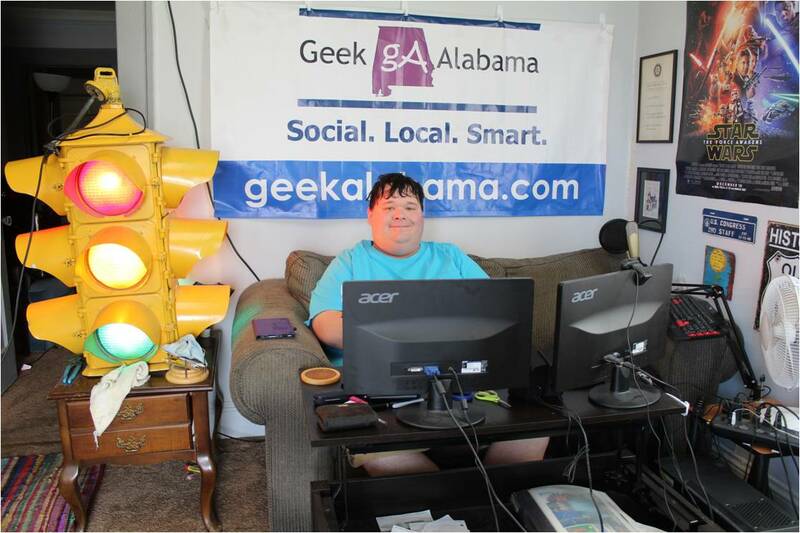 Many people have come to Geek Alabama to read the posts I have written and I love that! I was on ABC 33/40 in 2012 and appeared in a Atlanta Journal-Constitution Google Hangout. And I appeared in a UAB documentary in Birmingham. Here are the videos! I feel like Geek Alabama is only going to get bigger and bigger with time. Sadly this will mean I will make many more state politicians angry at this blog. I love doing that by the way! The new mayor in Anniston Vaughn Stewart wants me to be in a committee about streets and roads! This is a prefect fit for me but mayor first; someone has got to hire me! Maybe the mayor knows of folks who would accept a disabled person who might mess things up. I am hoping for a great Christmas season 2012. I will start it off by donating all the toys I got from the Activision Family Game Summit. Enjoy the holidays everyone. And hopefully I am not living in a car and homeless in Anniston. I guess getting paid for anything is a pipe-dream for me. Believe me; starving yourself because of lack of income is not fun! Also wondering about your future is not fun as well! P.S. : Sorry folks; I voted for Obama again.